Careers are a standard for The Sims and really one of the best ways to earn Simoleons and lead to a better life for your Sims… assuming that’s where your story leads. Careers can be daunting for some, especially in a new The Sims game that tweaks a few things you’re used to. Today we want to give you ten simple tips to hasten your rise from being a nobody to the top of your field! Some of these are obvious for long-term Simmers, while others you might not know about. Really, it’s a system of layers and finding the right strategy for YOU is part of the fun! 1. 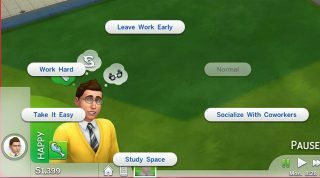 Needy: Fulfill your Sims’ Needs before sending them to work! Make sure they have had a shower, a full meal, and aren’t desperately in need of fun! Happy Sims are happy workers. 2. It’s All About Your Emotion: Every career level may have a different Ideal Mood. You can see which mood is the Ideal Mood by hovering your mouse over the Performance Bar inside the Career Panel. If you go to work with the Emotion specified, you’ll receive a nice bonus to performance. Plan your mornings or pre-work routine accordingly! 3. 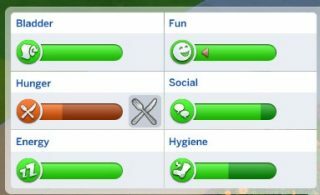 Extra Credit Goes a Long Way: In the same menu as your Sims’ Ideal Mood, you can find the Daily Task assigned by your Sims’ cruel bosses. The Daily Task, like Ideal Mood, isn’t required but at the higher career levels it’ll give you a big performance boost. These might change for every level of a career, so check back often to find out how you can give your Sim an edge on the career ladder. 4. The Pre-Work Routine: Fulfilling your Sims’ Needs before work is old hat. 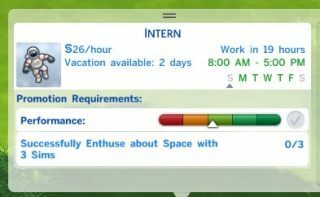 You should know that healthy, happy Sims are better workers than miserable Sims! But instead of just filling Fun, Hygiene, and Hunger (etc. ), do so in a way that’ll get your Sims in that Ideal Mood! For example, you can Take Thoughtful Shower to gain Inspired while also cleaning Hygiene. You can Browse Simpedia on your Computer to gain Fun and Focus. Optimize your routine to fill Needs AND bolster performance! 5. Paint Your Way to Emotion: The Easel is an Emotion generating machine. If you want to have certain Emotions when you go to work, and you want to do your pre-work routine in a certain Emotion, well, Paintings are a great way to do that. Especially before you earn Career Rewards (Step 10). Purchase an Easel. When your Sim is in an Emotion, like Focused, Inspired, Energized, Angry, or Sad (and others), click on the Easel. You’ll see a unique interaction that you can ONLY do when in that emotion. Hang these on the wall and click on them to Enable the Emotional Aura. Also, view them to gain that bonus. You’ll be emotional in no time. 7. Use Aspiration Rewards: The Rewards Store, accessed by clicking the Gift Box button in the Aspiration Panel, lets you spend Satisfaction (Earned by completing Whims and Aspirations) to purchase Reward Traits and Potions. Potions are a great way to instantly shift to an Ideal Mood just before work, especially on days when you’re hoping for a promotion. Reward Traits are great for enhancing your Sims’ capabilities. For example, if your Sim works at night purchase the Morning Sim Reward Trait so they can skill build faster before noon! If your Sims are workaholics, purchase Free Services. Then, you can get the Maid and Pizza on the house! Save time for WORK. If you aren’t buying Reward Traits, you won’t see your Sims attain their full potential. 8. Goooooooooaaaaaaals: Before your Sim can receive a promotion, they MUST complete the Goals assigned to them for their current career level. You’ll see these Goals under Performance. For example, this Sim needs to do the social “Enthuse About Space” with 3 different Sims. 9. Take Advantage of At Work Interactions: While they are working you can direct your Sims to do certain things based on their Career, their Emotion, and so forth. This is a great way to optimize their day! Click on your Sim’s tiny square portrait at the bottom to see what options are available. 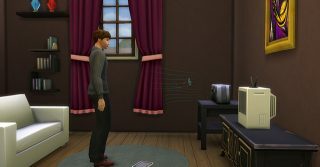 Some will affect your Sims’ Needs, their Emotions, or even their Performance. Experiment and see what works best! 10. Rewarding Items: As you earn promotions, your Sims will be given really impressive new items. Not only do they look cool, but they are generally superior objects. They’ll provide your Sims with faster rates of Skill gain, higher quality output, they’ll satisfy Needs more quickly, and many of them convey an Emotional Aura. If you’re trying to go to work in a certain Emotion, these will help you get the job done! You’ll find these items in Household Inventory, shown below. Hopefully this gets your brains going on various strategies you can pursue to help your Sims reach the top of their chosen careers. Be clever about how you pursue career advancement. As they say, work smarter, not harder!